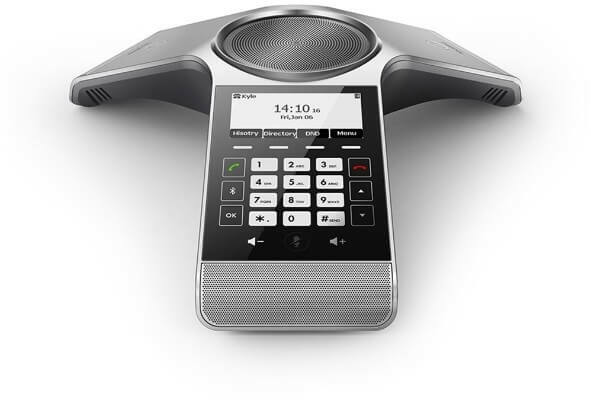 This Y-shape phone released from Yealink, representing the first letter Y of Yealink, owns a sensitive touch keypad which perfectly cancels the keypad noise and facilitates you conference room experience by simply putting all of the key conferencing functions at your fingertips. The Yealink CP920 conference phone, marrying the Yealink Noise Proof Technology, unburdens the business conversation by reducing annoying noise and minimizing distractions to set audio experience into a new level. Thanks to its built-in 3-microphone array, CP920 owns a 20-foot (6-meter) and 360-degree voice pickup range as if all participants are sitting across the table from each other! To protect business owner’s investments by supporting the migration to VoIP, CP920 allows you to connect Yealink PSTN box CPN10 with traditional analog phone lines. Without purchasing any extra PSTN server, just cascading two CPN10 can directly implement local three-way PSTN conference and offers flexible modes for business users: analog, IP or simultaneous analog-plus-IP. With Yealink CP920, up to five parties can join a conference call from different locations, helping your company cut costs and save time. Pairing Yealink CP920 with your smartphone or PC/tablet via Bluetooth allows you to turn the Yealink CP920 into a loudspeaker or microphone with ease. In addition, you can merge your smartphone or PC/tablet, SIP call and PSTN call into one hybrid UC meeting.